CATS LOVE CARDBOARD - each cat carer knows that. that attracts cats like a magnet. Just bring any cardboard box home and it will find its cat lover immediately. That is why we created myKotty furniture. For modern cats and their owners. and provide unforgettable experience for your cat? Multifunctionality is their middle name. a cottage and a playground - all in one. and HAVE FUN and those are activities natural for cats. how old, how small or big, or what breed it is. Each cat will find something for itself in our furniture. We set a new standard of safety. We all know how sharp an edge of the paper can be. That is why we set a priority in designing our scratchers: safety. which provides a super smooth surface, that feels like suede. Our cardboard is the best. All materials which we use to produce our scratchers are very durable. We tested their durability for almost half a year on our cats. We checked that one scratcher can be used for the maximum of one year. We use ecological glue, which is commonly used for food packaging. Our products are safe for animals and humans. friendly and safe for cats. and all our production take place in Poland. We are proud of that. We personally are cat owners and cat lovers. That's why we know what cats like and we know their lifestyle. Besides, our two cats were the first testers of our firniture. Successful testers. finishing at your door with the home delivery. Our packagings are resistant to transport damage. They have security labels that make sure you are the first one who opens the box. 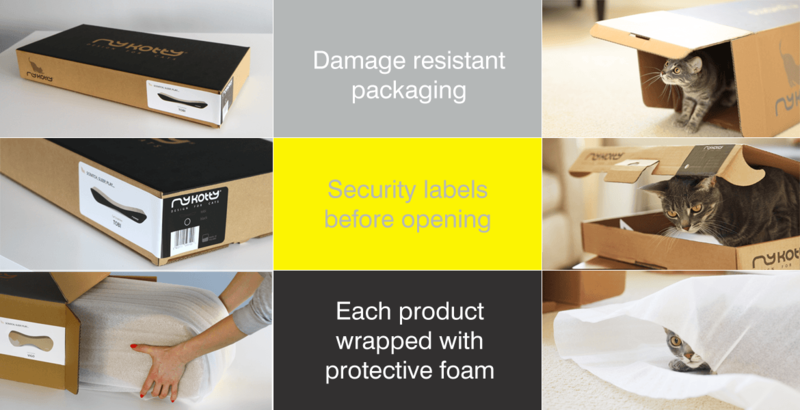 Each product is wrapped in a protective foam.